IRELAND SUFFERED THEIR second defeat at the ICC Women’s World Twenty20 after losing out to Pakistan by 38 runs in Guyana. Led by captain Javeria Khan, Pakistan made 139-6 from their 20 overs with Khan staying unbeaten on 74 of 52 balls. 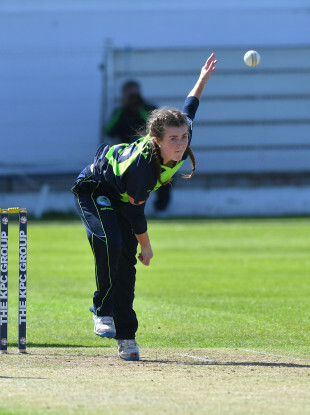 Lucy O’Reilly bowled well for Ireland and took three for 19 but Ireland could only manage 101 for nine as Pakistan scored their first win of the tournament after losing their first two matches. Meanwhile, only Clare Shillington (27) and Isobel Joyce (30) – sister of former Ireland and England international Ed – reached double figures for Ireland. Following their opening defeat to Australia in the tournament, Ireland are bottom of Group B and will face India in their next match on Thursday. “Pakistan are closely ranked to ourselves, so that was the obvious target that we were going to go after. Elsewhere, Australia booked their spot in the semi-finals after defeating New Zealand by 33 runs to clinch their third win of the tournament. Email “Ireland still seeking first win at Women's World T20 following 38-run loss to Pakistan ”. Feedback on “Ireland still seeking first win at Women's World T20 following 38-run loss to Pakistan ”.